This large parcell has tons of potential. It is located in Coronado, just south of Ojochal, and aprox 15 min from the paved coastal highway. The top 1/4 of the farm is dense primary jungle and there is rarely a moment when you don’t hear the howler monkeys howling in the distance! The rest of the farm is a mix of pasture and wooded areas that follow a series of ridge lines running across the property. There are countless buildable areas throughout the farm, and aprox 15 with ocean views. The ocean view is nothing short of amazing with views of the Osa Peninsula, Cano Island, the Rio Terraba, and waves breaking down the coast!! Then when you turn around the jungle backdrop will take your breath away! The property also has 2 kms of river frontage with 12 waterfall, the biggest being 150 ft, and countless swimming holes. 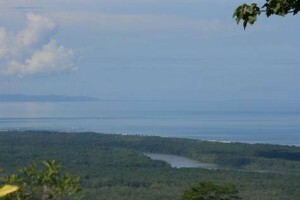 This property can be used for may diferent things….20 very large lots set among sections of dedicated green belt areas….8 – 25 acre mini farms, each with huge ocean views, river access and space to build a large family compound….a retreat or wellness center….or a single property to be developed and enjoyed by the owner!!! !